A few weeks ago Gee was kindly sent the beautiful Horse Heaven Jigsaw puzzle from Ravensburger and with her love of everything equestrian it was sure to be a huge hit. On wet rainy days there is nothing she likes more than to sit down and complete a jigsaw, I think she finds it relaxing and fun. This puzzle is aimed at children 9 years and over and consists of 300 quality pieces, measuring approximately 49cm x 36cm when complete. The original photograph was taken by UK wildlife photographer Greg Cuddiford. Gee loved the variety of horses on the jigsaw ranging from the rather cute Shetlands to the stunning Skewbald all set in a lovely countryside background. The jigsaw was quite difficult in places as there is quite a lot of similar colours but with a little patience and help from Mummy we finally completed it. 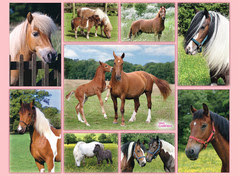 This would make a lovely gift for any girl or boy who loves horses or and can be bought for £7.70 on Amazon. We were sent this puzzle free of charge for the purpose of this review. Ahh! This looks like a very cute puzzle. Aww this looks sweet :) Love horse. I took some lovely pictures of some horse for my next post, ha! !